​Many moons ago, in a mystifying land called high school, a rather cool, talented twelfth-grade actress invited a quirky, confused, punkish-goth sophomore girl in the theater department to her birthday party at the Southside Preservation Hall. There, the little quirky girl found a piece of home, as 1940s jazz danced through the twinkling lights and spilled out the open windows into the night. Eleven years later, the little quirky swing dancing girl dances, choreographs, and teaches professionally, holds a Bachelor of Arts in ballet and modern dance from Belhaven University, acts in and directs plays, and is generally a little obsessed with the arts. In the world of swing, Brigette loves Lindy Hop, Collegiate Shag, Balboa, Charleston, Tap, and Solo Jazz. She believes that the arts, and especially dance, and especially swing dancing, point to a world of love, offer a much needed connection point to other humans, and can open a portal to creativity and joy. Brigette clearly also likes words and writing, as well as poetry, Jane Austen, C.S. Lewis, snails, coffee, boxes, trees, and getting lost in other countries. ​Bryan was first exposed to dancing through community Zumba classes, where he learned that it was fun to move your body, even if it looked like an awkward giraffe dance. Bryan occasionally tried different dances just for the fun of it with friends, until he tried swing dance in the winter of 2015. The freedom, fun, and creativity of jazz and swing caught him. He has been dancing ever since. He tries to reflect those concepts in his dancing, and always has a goal for him and his partner to share a laugh. Bryan found swing dancing in college in Texas. Since then, he has traveled the U.S. finding ways to build his dance style from a variety of scenes, instructors, and competitions. As a teacher, he specializes in Lindy Hop, Charleston, and vernacular Jazz. He has been a part of the award-winning ACME Swing Team for more than four years, placed in various contests throughout the U.S, and taught in the DFW area for the past three years. He hopes that when you leave his class, you will not only have improved your swing dancing, but will have improved your all-around dancing skill as well. ​Cemre discovered swing dancing in 2016 when she was at her third year in graduate school. After going out to Sons of Hermann Hall to take her first dance lesson ever She was hooked and never spent a week without dancing since that day! She likes taking lessons in Lindy Hop, Balboa, and Blues and enjoys traveling for workshops. Her recent discovery is Collegiate Shag and she grows more passionate about it every day. Outside of dancing, Cemre is a scientist who can be found listening swing tunes while performing experiments. She occasionally takes off her headphones to let her mice in the lab enjoy it too! She likes traveling for conferences or for fun and makes sure to explore local dance scenes during her trips. ​When not building websites or apps during the wee hours of the night Chris is probably out dancing. He enjoys incorporating randomness into his dance (and life for that matter) and if you see him thinking heavily during a dance he either has an animated gif stuck in his head or is trying to think of a new animal dance move. He started getting serious about dancing after a mutual friend brought him as a wingman to Sammons Center for the Arts and it turned out to be a great way to meet new people. From then on it's been a wild ride starting with taking classes with Elaine Hewitt, traveling to many of Lindy and Balboa events around the country, and can even occasionally be seen instructing in Fort Worth at FWSDS. ​While Fort Worth is her birthplace she has not always been able to call it home. Jennifer grew up in Mississippi and that is where she began her journey with dance. She started taking classes at an early age and was able to join dance teams that have taken her to the Macy’s Thanksgiving Day Parade, Jingle Elf Parade and the Superbowl. Jennifer graduated from Ole Miss and was introduced to ballroom dancing thereafter. She then finally returned to Texas to stay and has been social dancing ever since. She dropped in for a swing class at the Eldorado Ballroom in Houston and left with a love of Lindy Hop and an appetite for Balboa. Jennifer found her way back to Fort Worth and is thrilled to continue with another team, 35Jive! You might just see her dancing her way across Texas or at the next Lindy Focus! ​Jonny started dancing as a bboy in 2011. In 2016, he found his new passion for Lindy Hop after discovering how fun it is to dance with another person. Coming from a Hip Hop street dance, he hopes to bring something new to the table while still respecting the dance's tradition and foundation. Though still early in his Lindy Hop dance journey, he hopes to be inspired as much as possible from different styles, old and new, in order to one day become a competent new face in the scene. When not partner dancing to swing music, Jonny finds other hip hop dancers like him and tries to smoke them. ​During a childhood of solo dance classes in ballet, tap, and jazz, Laura caught swing fever when she saw "Swing Kids" at the age of 8! But it took years for her to embrace the social nature of swing by actually going to a dance! Once she mustered to courage to do so, Laura instantly fell in love with the conversational dynamic of swing and its liberty of creative expression. Through her travels around the country and overseas, Laura has learned that if you dance, you have a community anywhere. In fact, swing dancing has taught Laura so much that she is certain Lindy Hop will one day reveal to her the meaning of life. ​Meagan fell in love with swing dancing as a freshman in college and hasn't stopped loving it since. Being in a college scene gave Meagan the opportunity to get involved with all facets of a swing scene, from event-planning, to performing, to choreographing, to teaching - and she loves every bit of it! She particularly enjoys the way that Lindy Hop allows her to communicate with a partner, and to interact creatively with the music. Nothing gives her more joy than knowing that, through her dancing, she can create happiness in others. When she's not dancing, Meagan is probably at the gym, doing yoga, or writing. Ever since Megan was introduced to swing dancing she has been falling more in love with it everyday! She enjoys learning more about swing dancing by taking lessons in Lindy, Charleston, Blues, Shag, and Balboa as well as attending dance workshops when possible. Megan loves that swing dancing is such a true social dance and that there are no limits on the improvisation, musicality, and inventiveness that can happen within the dance. 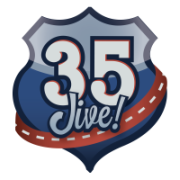 She is extremely excited anytime she gets to share the joy she gets from dancing with others and is thankful she gets to do just that with 35 Jive. Shelby started swing dancing in 2011 in Orlando, Florida. He never imagined that it would open up opportunities to dance not only around the United States, but as far away as Sweden, where he attended Herräng in 2016 as a Frankie Manning Ambassador! Whether Lindy Hop, Blues, Charleston, or Balboa, Shelby is inspired by the music and loves to create art on the fly with another human being. Shelby works to inspire other dancers' creativity on the social dance floor, as well as expand their minds in the classroom setting. According to her parents, Tina has been dancing her whole life. They are glad that she is now dancing on the swing dance floor, and not choreographing Billy Joel songs in their living room with all their valuable breakables. High school show choir was Tina's introduction to the performance dance world, and since then she has dabbled in many dance styles, including jazz, modern, tap, ballet, liturgical, and West African. In the summer of 2005, Tina worked with the Bi-Okoto School of West African Dance and Drum in Cincinnati and the Rhythm & Motion Dance Center in San Francisco. After moving to Texas, Tina joined the social dance scene with progressive double two, and then discovered Blues and East Coast Swing at Sons of Hermann Hall. This is where she married her husband, fellow swing dancer Zach Malone, two years later, and she has continued expanding her dance repertoire into Lindy Hop, Charleston, Balboa, and Collegiate Shag. ​As a long time lover of Jazz music, Swing was the perfect style of dance for Trent. He joined the Comet Swing Dance Society at UT Dallas in 2016 and is currently acting as Vice President. He teaches the beginner lessons at UT Dallas and will soon be teaching with the Dallas Swing Dance Society at the Sammons Center for the Arts. Outside of dancing, Trent enjoys playing several sports and instruments. He is currently studying Actuarial Science and Mathematics (his favorite numbers are 5,6,7,8).